AC Milan presented new signing Lucas Paqueta to the media on Tuesday, with the Brazilian starlet pictured holding up his new jersey. 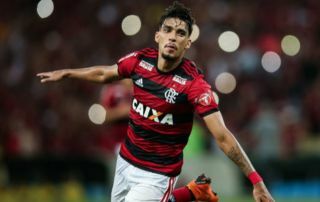 The 21-year-old joins the Rossoneri in a reported €35m deal from Flamengo, as per Sky Sport Italia, and will be expected to make a key impact with his creativity and goal threat in the final third. He bagged 13 goals and five assists in his final season with his former club, and now he’ll hope to adapt and settle as quickly as possible to emerge as a key figure for coach Gennaro Gattuso in the coming months as the Italian giants pursue a top-four finish in Serie A this season. Milan return to action against Sampdoria in the Coppa Italia this weekend after the winter break in Italy, and so it remains to be seen whether or not he makes his debut immediately. Perhaps the sensible decision will be to ensure he’s entirely ready for his first outing, and so Gattuso and the coaching staff will undoubtedly monitor him this week before making a decision. As seen in the images below, Paqueta has opted to wear the No.39 jersey, and there will surely be plenty of anticipation amongst fans to see their new signing in action with Milan hopeful that he can make a positive impact to help them secure Champions League qualification.